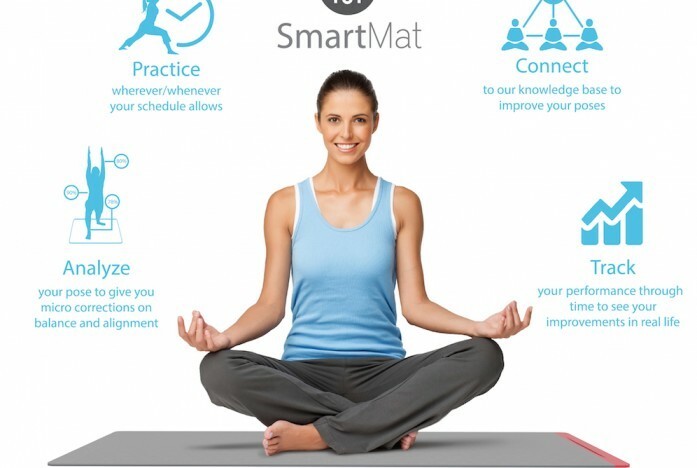 SmartMat is a portable Yoga Mat which helps to track, improve & perfect yoga practice by learning a user’s position and suggesting incremental improvements through their progression toward a Perfect Pose ™. The product allows for users to practice and learn in home,, without having to attend public classes or hiring a private instructor.SmartMat communicates with the user through smartphones & tablets and offers an In-Class Assist & In-Home Private mode to fit & improve the user’s lifestyle. Yoga is one of those exercises that looks easier than it is. With the complex positions and the ability to stretch into the correct form and breathe deeply at the same time, it’s not just simple as it appears on the surface. For those serious about taking their yoga practice to the next level, the type of mat you use makes all the difference, particularly if you use the SmartMat. The mat will even help you to balance better in different poses or offer suggestions on how best to tweak the structure while you practice. The app also comes with classes to best fit your favorite styles or needs for the day, which allows for an even greater degree of practicing yoga the way you want to. The mat itself is not bulky in the least — it’s 4-ply means it’s deigned to be thin and sleek while still connecting to mobile device, thanks to a Pierzoresistive layer. The battery life lasts 6 hours, is charged via USB like most smartphones, can be rolled up without damaging the device, is water resistive, 100% latex-free, and can stand temperatures up to 110-degrees Fahrenheit. At that time of writing, the SmartMat campaign has earned almost $200,000, far more than its original goal of $110,000 with more than 20 days more to go. If you want to support the company and be one of the first people to have the mat in their home, it’ll only cost you a donation of $347, a hundred dollars less than the retail price, and comes with access to the app for either Android of iOS.